This entry was posted in Baking, Breakfast, Dessert, Recipe, Slimming World by Jen. Bookmark the permalink. Wow these pancakes are great and have no syns!, even my little boy said “it’s yummy can we have them tomorrow ” thanks Kerry . Really pleased you and your little boy enjoyed the pancakes so much! Being syn free you could enjoy them every day if you wanted to! Tasted of chemical sweetener (used Canderel). Not like a real pancake at all!! A tip about cooking them, you need to spread the mixture very thin across the whole pan. The fist one I tried I just poured the mixture into the middle and it didn’t work at all. The second one was passable with plenty of banana to mask the taste of sweetener but probably not that good for you with all the chemicals in it.. These pancakes are never going to be exactly like a real pancake, they’re a fat free slimming world version so there has to be a compromise! If normal pancakes were syn free I would be a very happy lady! I used Splenda and was pleased with the result so it’s a shame if you weren’t satisfied with them. I added blueberry to mix. just tried them when i was on the verge of pigging out on crisps!!! I read on google that these pancakes are not syn free because the bananas are mashed and cooked? 5syns. is this correct? These pancakes don’t include any mashed banana so they are syn free. I understand that there is a mashed banana version which wouldn’t be syn free as the process of mashing/cooking fruit can result in them having a syn value. Yum! Made them this morning. Happy pancake day everyone!! I’m going to try these out tonight! That’s fab! Not too bad at all! Enjoy!!! Amazing we missed out last night as no flour then found these. No matter how long I whisk the egg and sugar I do not get any stiff peaks it just looks like milk! What are you using to whisk? You really need to use an electric whisk for a good few minutes. Also your eggs won’t go into stiff peaks unless your whisk is completely grease free. Sometimes no matter how many times you wash the whisk it can still be greasy. The best method is to rub a bit of vinegar over the blades. You can’t taste the vinegar when you cook the eggs. I do this every time I make a Pavlova and it works every time! Great tip! A bit of vodka does the trick as well to ensure a clean bowl & whisk! Tried both these and the SW ‘magic pancakes’ which use hexb portion of rolled oats, eggs, sweetener and Muller light. These, to me, still tasted like a strange sweet omelette. Although I’m sure if piled high with fruits and yogurt etc would be… Okay. The magic pancakes on the other hand are DELICIOUS just on their own, and with toppings as well are just like regular pancakes. So basically, it’s worth using your hexb to have genuine pancakes instead of sweet eggs! I we surprised how good they taste. I did find the sweetener a bit overpowering, so might try again but with less sweetener, or cut it with a squeeze of lemon juice. Thanks for giving me the confidence to try them….I expected a sweet omelette too. Hi can you use quark in place of the cottage cheese? There is no cottage cheese in this recipe, just egg & sweetener! Just found this recipe and made them. Fantastic. Really hit the spot. I put total 0% yoghurt,strawberries and blueberries. Yum yum. Wowie, so pleased that I came across these recipe!! These are absolutely fantastic, and really hit the spot. I made 4 small drop pancakes with my mixture and layered them up with bananas, plums and grapes and then drizzled a couple of teaspoons of golden syrup over the top for a few syns. Tasted just like I was eating pancakes (I was sceptical that they wouldn’t) and wow wow wow. Hi, it does create quite a light mixture and they don’t ‘pour’ onto the pan as such. I’d suggest it’s better to have a smaller circumference pancake than to try and spread the mixture too far or they could break apart a little. I find gently spreading and teasing the mix out in the pan is the best way to spread, but they should be quite thick/deep in the pan, rather than thin like a traditional pancake mix as they do have a lot of air in them. Hope this helps! Sorry to hear that Sarah, they are quite a light mixture and they don’t ‘pour’ onto the pan as such. I’d suggest it’s better to have a smaller circumference pancake than to try and spread the mixture too far or they could break apart a little. WOW! These taste great on their own! I love real pancakes big time and these are very good, not that filling but hits the sweet spot! Will try with some crispy bacon and maple syprup soon. Thanks. Is this correct, 6 tablespoons of sugar (english measurements) ? I tried this recipe but just got a heap of burnt sweetner, surely it should be teaspoons? Hi Jackie, the standard recipe calls for 6 tablespoons but this can be adjusted based on personal preference for taste. Not sure why your mixture would have turned out this way. I tried these with my daughter-Inlaw Emma OMG!! How surprised was I they were yummy I really enjoyed them so much I asked for the recipe, any other tips pass them on please??? I have these but squeeze lemon juice on the as the pancake is sweet itself – tastes like lemon and sugar topping! I also cut up a banana with them! I tried these this morning and it was an epic fail! The mixture appeared to be really thick and not of a consistency that would pour so I tried to add a bit of water and it just didn’t work at all! Also think my pan was too big so I gave up in the end. I may buy a small omelette pan and give them another go! I’m so sorry these didn’t turn out well for you. The mixture is very thick so it doesn’t pour so well, the egg whites hold the mixture together quite strongly. A small pan you can tip the mix into and then spread out would work much better than a big pan. Loved these, at slimming world for 3 weeks and this is the first thing I’ve eaten that has given me that satisfyingly sweet feeling. Was wary about the sweeter but chopped a banana on top and a load of muller lite toffee yoghurt. Yum yum. Wanted to have another lot straight after. Gorgeous. I was also sceptical when I read the ingredients, thinking it would be a sweet omelette. I am willing to give them a go though, can they be made like American style pancakes? Not sure what you mean? The batter is thicker than American style pancakes due to the whisked egg white so it doesn’t ‘run’ the same way. Hi, I don’t think this would work as the mixture wouldn’t retain the air that you put in when you whisk the whites. You can give it a try but I don’t think they would come out right unfortunately. Probably best to keep this one for mornings when you have a little time! Hi, iv just tried this as got in from work early and was staving but didn’t want too much as tea will be in a few hours. Well can I just say a HUGE thank you! I absolutely loved these. I used a piping bag cut to make a wide hole, this helped me control the speed of the pour and the shape. I also put in less vanilla and used stevia too, tasted great. Thank you so much. Looking forward to trying it with cinnamon! Just saw these shared on our SW group – I know the recipe is a few years old now but these are no longer syn free – latest SW book has tablespoons of sweetner at 1/2 syn each, so these are now 3 syns – still well worth it! Thanks for your comment, you’re totally right, I need to update the post as it’s a couple of years old. 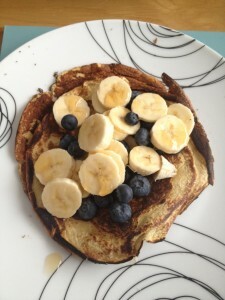 I actually have a new and VERY exciting 0.5 syn pancake recipe to post so I need to get on that asap! These were yummy!! I’m not great usually with new things but I’m trying really hard this time to stick with the plan. So when I reached breaking point this evening I really needed something to satisfy my sugar cravings. I got two aesthetically pleasing pancakes which tasted just as good as they looked. Ok they definitely didn’t taste the same as normal pancakes but I’ve had worse served to me in a restaurant. I’m not sure why but mine were not as thin as I expected. They were quite fluffy and thick actually. I loved the hint of vanilla and I put a small drizzle of honey, a dollop of squinty can cream and a few strawberries. And wow! Thanks so much for posting this.